Description: In honour of World Voice Day iSing Magazine is offering 1 year of free membership to The Tribe membership if you sign up between 9AM-9PM GMT. 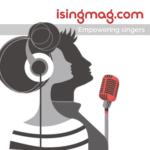 Here you can access all past issues, future articles, webinars, a vocal warm up course and discounts for singing related products and services. iSing Magazine is dedicated to singers and singing. We also love featuring singers, so feel free to submit your work through the website.